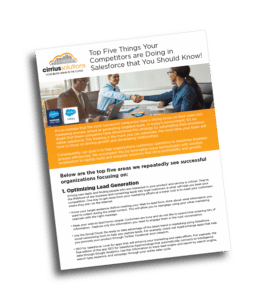 Our customers have had tremendous success with Salesforce Communities and have used them to completely transform their businesses using customer, partner and employee portals. 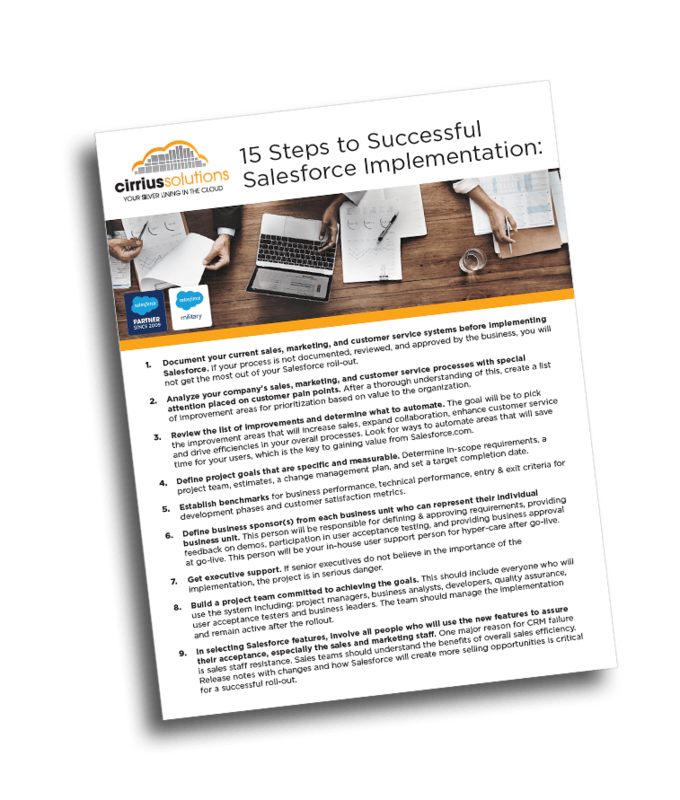 Cirrius Solutions can extend the Salesforce experience to your customers, partners and employees with seamless and secure design. You decide how much and what they can access. Cirrius consultants will help you create Salesforce Communities that are personalized, integrated, branded and engaging to ensure a seamless extension of your corporate identity. Using Salesforce Community Cloud, we leverage the technology to maximize the collaboration with your target audience. The Cirrius team is excited about the new Salesforce Lightning Bolt framework that will make deploying next generation communities and portals even faster. With Lightning Bolt, companies can jumpstart the creation of a new community, next-generation portal or customer-facing website. 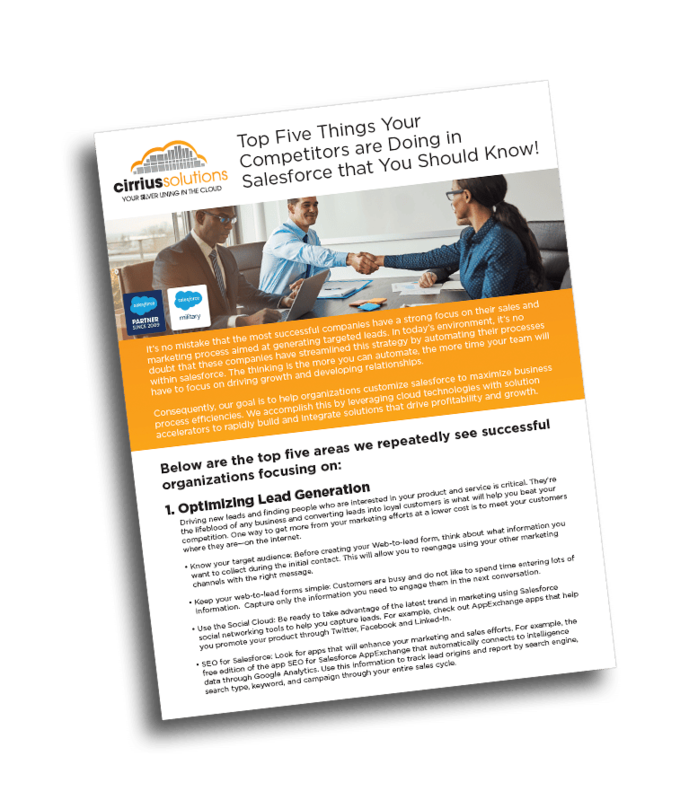 This seamlessly integrates with Salesforce CRM in a fraction of the time and with far less investment than what was required before. Our developers will leverage Lightning Components to build Bolt solutions that have deep business logic and workflow built in. This includes e-commerce, recommendation engines, and case management, all with drag and drop ease. The Cirrius team will help you create thriving Communities starting with the definition of a social roadmap. This includes laying out the related vision, goals, and objectives and elaborating on advanced adoption strategies. Salesforce communities can be created quickly and deployed for immediate interaction with your customers, partner and employees. Provide complete control over the data that users can access through sharing rules, role permissions, and delegated administration. Ensure that the users only see the information they need in a simple interface. The Cirrius team will build fully branded, mobile-optimized communities and portals that are completely integrated with your business process and lightning fast. The custom branding will provide a seamless look at feel to your target audience. Give partners, employees and customers access to interactive dashboards to provide valuable insights into the selling and support process. Users can see performance summaries, historical benchmarking, pipeline visibility and forecasting to drive business goals and improve collaboration. By creating a community platform for customers to share, you give your customers access to not only your knowledge base, but other community members thoughts, as well as those of your employees and partners, offering the ability to combine your existing resources with crowd sourcing tips for much faster customer service outcomes.